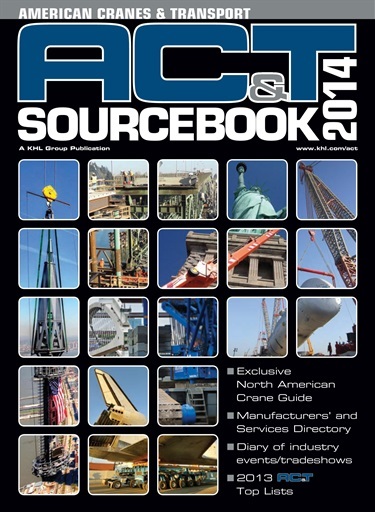 The fifth edition of the American Cranes & Transport Sourcebook 2014 features an extensive Crane Guide which covers every model of crane sold in North America. 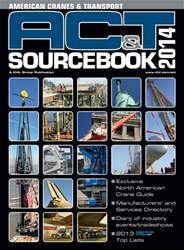 This publication also features an extensive Manufacturers’ Directory and Services Guide for products produced and services offered in North America for the crane rigging and specialized transportation sector. This year, the directory has been redesigned for ease of locating the companies you do business with. There is also a Specialized Transportation Manufacturers Directory that features a comprehensive listing of manufacturers of trailers and transport systems marketed in North America. This is the only place to find all four of ACT’s annual top lists, including ACT 100, ACT Transport 50, ACT Specialized 50 and ACT Tower Cranes 50.